With a street price of only $1,299, the ViewSonic PX800HD is one of the least expensive ultra short throw (UST) home theater projectors on the market today. And though its high contrast, well-saturated picture and its RGBRGB color wheel make it ideal for easy-install, do it yourself dedicated home theater use, its very quick 16 ms input lag makes it highly desirable for serious video gamers as well. As one of the few 1080p ultra short throw projectors with Full 3D, the PX800HD is a unique projector at an outstanding price. The huge benefit of UST is that (a) it gets rid of ceiling mounts and (b) it eliminates the limitations related to throw distance and throw angles you run into with rear shelf installations. You just place the PX800HD on a low table beneath a wall-mounted screen and you're in business. There are several UST projectors on the market with higher lumen output and lower contrast. They are fine for ambient light entertainment and presentation use. However, with a contrast rating of 100,000:1 and a brightness rating of 2000 lumens, the PX800HD is better suited to high quality home theater as it is designed to optimize black levels, shadow detail, color saturation, and overall dynamic range instead of lumen output. As such, the viewing experience is best when set up in a dark home theater or in low ambient light. Though the PX800HD can easily be used in ambient light on a 100" screen, it hits its dramatic sweet spot when moving up to a 120" to 130" image in a dark theater setting. The PX800HD offers the kind of deep black that's typical for DLP-based models, as well as the high ANSI contrast we expect from the technology, yielding very good detail definition in both shadows and highlights. The perception of contrast varies among its five preset color modes. For example, the Movie mode is a little cooler in color temperature than Rec.709, but the advantage is that it delivers slightly richer color and increased image contrast and depth. While the color is technically less accurate, Movie mode looks subjectively quite balanced and many users will prefer it to Rec 709. The PX800HD puts up a remarkably sharp image from top to bottom and side to side-an achievement for a UST projector. Our test unit displayed crisp, clean 4.5 point text across the entire image. Image sharpness is also ensured by the single-chip DLP design, which guarantees all color channels are in perfect convergence (not always the case with any three-chip light engine). Though the single-chip DLP design can produce rainbow artifacts due to sequential color updates, the PX800HD shows them only rarely, so very few users will be bothered by them. The PX800HD's "Brightest" mode maximizes brightness with the consequential compromise of color accuracy, with a noticeable green bias as is typical. Dynamic mode has a more subtle green bias that's closer to expectations for the brightest mode of a home theater projector. It is quite functional for casual gaming or TV viewing as the color error is not distracting. The default settings for the remaining three color modes--Standard, Movie, and Rec709-are all closer to accurate. There are no user modes, but you can customize all of the predefined color modes, adjusting basic settings like contrast, brightness, hue, and color temperature. If you want to invest in professional calibration, the PX800HD supports ISF-certified Day and Night modes, which you can optionally add as choices to the Color Mode menu. 3D Video. The PX800HD comes ready to work with DLP-Link glasses and has a Sync port for third-party emitters to let it work with Vesa RF glasses as well. The 3D color mode has a subtle green bias and no way to customize it. However, the green shift is not excessive and most people will consider it within a tolerable range. We didn't see any crosstalk, and we saw only minor 3D-related motion artifacts in clips where they tend to show. All things considered the 3D system is quite serviceable for users who are into 3D. Brightness. Using Normal and Eco lamp settings, the measured ANSI Lumens for each color mode for the PX800HD is as follows. Low Lamp Modes. Eco mode is about 30% lower brightness than Normal mode. There are also two other lamp modes to choose from, but neither is an Eco feature in the usual sense. SuperEco mode is an automated power-saving feature. Dynamic lamp mode works much like an auto-iris. It makes dark scenes darker by lowering lamp brightness, and incidentally conserves energy and lengthens lamp life. Video Optimized Lumens. Our pick for Video Optimized setting is Movie mode at about 1075 lumens without adjustments, although some people might prefer Rec. 709 for its more precise color. Movie mode is a bit cooler than Rec. 709 mode, but the hues aren't far off and it has the advantage of superior contrast, a greater sense of image three dimensionality, and higher brightness. Presentation Optimized Lumens. If anyone want to use the PX800HD for business presentation, Dynamic mode offers nicely saturated color with much better color accuracy than Brightest mode. Its 1375 lumens is enough for a 100" image in moderate ambient light. Brightness uniformity. The measured 75% brightness uniformity is lower than we like to see for home theater projectors, but it is typical for an ultra short throw model. The variation in luminance is visible on a white 100 IRE test image, with the brightest area at the bottom center as you'd expect. However, with complex video imagery you never will see the difference to the point that it is consciously distracting. The uneven illumination is hard to see even if you're looking for it, so it is a flaw that people will be happy to live with in exchange for the convenience of ultra short throw. Color brightness. The RGBRGB color wheel turns in excellent performance in color brightness. There is no white segment in the wheel to boost light output at the expense of color saturation and contrast. Therefore color is well-saturated and white highlights are in natural visual balance with colored subject matter in all preset modes. The color presets vary in measured color brightness from just under 80% of white for Brightest, Dynamic, and Standard modes, to 100% for Rec.709. Fan noise. In Normal power mode, the fan noise (rated at 35 dB) is more than we like to hear in dedicated home theater. It is noticeable during quiet movie interludes at typical seating distances from the screen. In Eco mode (29 dB) the noise drops quite a bit in both volume and pitch and thus becomes less of an issue. The good news is that it does not vary at all in either volume or pitch, so it is easy to become unconscious of it. In High Altitude mode--which ViewSonic recommends for 4920 feet and above, the sound ramps up to a higher pitch and becomes quite distracting. If you live in Denver, don't buy this projector without planning to surround it with external noise baffling materials. Input lag measures just 16 ms with 3X Fast Input On. It is rare to find projectors that drop below 20 ms and most are not anywhere near that quick. Even with the feature in its default Off setting--the equivalent of Fine mode--the lag is only 33 ms.
Lamp life. ViewSonic rates the lamp at 3000 hours in Normal mode and 6000 hours in SuperEco. Warranty. The price includes a three-year warranty for parts and labor--with the first year including free express exchange service--and one year for the lamp. The PX800HD is easy to handle, at only 13.4 pounds and 6.0" x 15.3" x 17.1" (HWD). The easiest way to install it is to place it on a low table or bench just in front of and below the screen. If you want to go to the trouble you can also position it in a wall mount above the screen. As with any UST model, getting the image focused and squared off just so is a little tricky when you're just a foot or two from a big screen. You won't want to do it more than once, so few users will be considering portable applications. The lensing system uses a mirror as the final element to reflect the image through a window near the back of the projector. Throw distance, as measured from the window, is 14.5 to 31.4 inches for a 16:9 diagonal image size of 70" to 150". For the smallest image sizes you may need data and power cables with right angle connectors. With a 70" image, the projector nearly touches the plane of the screen, and almost all of the ports are on the front (wall-facing side) of the unit. Going beyond 150" diagonal tends to create geometric distortion and problems with focus. The window near the back of the PX800HD is in a depression and on a slant, putting the center spot of the window about 2.1 inches below the top surface. The image offset shifts the bottom of the image above the window by roughly 18% of the image height. For a 90-inch image, that works out to about 8 inches above the window, or about 6 inches above the top surface. Port access. Aside from one HDMI port for a wireless dongle that is tucked away in a hidden compartment, all of the ports are on the front of the PX800HD, facing the wall. The placement hides the clutter of cables which is aesthetically ideal. However, it can also require you to move the projector when you need to add or remove cables. Once you move it, you'll have to go through the processes of squaring off the image and getting the focus right all over again. All UST projectors require exact placement, so once installed you don't want to move them unless you have to. May have to replace standard cables and power cords. For smaller image sizes, the placement of the ports can mean you have to buy cables with right-angle connectors. Standard connectors--including the one on the provided power cord--can easily stick out far enough to hit the wall the screen is mounted on even with the projector still too far from the screen. Screen Size vs. Fan Noise. The PX800HD can create an image up to 150" diagonal, but you would want to operate in Normal Lamp mode for that size screen. In a dedicated dark theater, some users will want to add external sound damping to neutralize the fan noise. Audio Quality. The PX800HD's built-in stereo audio, with two 10-watt speakers, but the big picture experience you get from the PS800HD demands big, deep sound as well-bigger than you can get from the onboard speakers which tend to lack bass dynamics. You'll almost certainly want to plug in a good external sound bar, if not a full surround sound system. No Frame Interpolation. FI is a common feature on many home theater projectors. It is controversial, and many users of projectors that have it don't use it. But the PX800HD does not have it, so the option does not exist. The ViewSonic PX800HD is a highly unique projector for home theater that can also be used for casual home entertainment or serious video gaming. It has solid contrast, rich color saturation, almost zero rainbow artifacts, and a surprisingly sharp image across the entire screen. Though it can technically go to 150" diagonal, its sweet spots are 120" to 130" diagonal for dark room viewing, and 90" for moderate ambient light family room use. Its ultra short throw means easy set up compared to the ceiling mounting required for many home theater projectors. At $1,299 the ViewSonic PX800HD is an outstanding value and highly recommended. I noticed some waviness in the image when projected onto a flat wall. I know this projector should ideally be projected onto a tensioned screen, but the waves were appearing in places like the center and top right corner to an extent that seemed extreme for a fairly flat wall. Did you have any issues when you were running your tests? When projected onto Viewsonic's Brilliant Color Panel, will the screen eat up a lot of the brightness? I know the contrast will increase, but will it be at the sake of brightness? Good review! I have a high contrast screen (euroscreen react), do you think there will be a spotlight effect since this is a short throw projector? Why do these have to be so ugly? This is what my choice is for home theater equipment aesthetics? 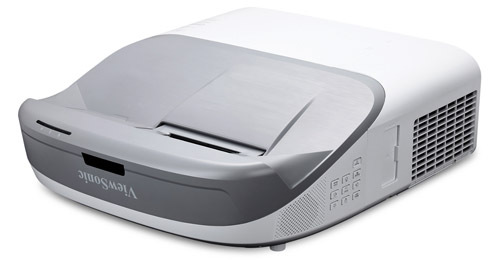 It looks like some 1997 printer/scanner monstrosity. Why would I want to place that directly in my line of vision right where my center channel goes? 13randon, it is not ugly in the least. I have added another pic of the unit to the review, just above the Conclusion. This is the view of the projector from the user's perspective when watching it. It is actually quite an attractive design, as far as these things go.